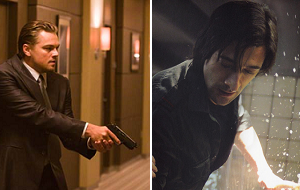 Consider Inception and Splice the tale of two Warner Bros. marketing campaigns. For Splice, the widely seen trailers give us an eyeful of the creature at the heart of the story, a tale of scientists who create a new life form by combining human and animal DNA. And there's Inception, a would-be blockbuster audiences have little knowledge about. The initial poster didn't play up the marquee faces in the film--you didn't see Leonardo DiCaprio's famous mug plastered across the one-sheet--instead opting for a curious shot of a cityscape seen from above. Even the newest trailer wasn't made readily available online during its first couple days of release. You had to go to the film's twitchy web site within a web site, www.mind-crime.com, to see it. By the time Iron Man 2 hit theaters, movie fans had already engorged on numerous trailers, action teasers and spin-off merchandise. They could recite all the new characters to the franchise by heart. Can a film like Inception give the other, better branded summer films stiff competition, or is the studio simply waiting until it's closer to the movie's July 16 opening date before firing off an aggressive campaign? Robert Marich, author of "Marketing to Moviegoers: Second Edition," says slow marketing campaigns are typically risky for titles without built-in brand recognition. A Harry Potter sequel, for example, can work the mysterious route without fear of losing big on opening day. DiCaprio remains a name for movie goers to latch onto, and his presence helped make a difficult film like Shutter Island become a hit earlier this year. But Marich cautions that the man behind the camera for Inception, The Dark Knight's Christopher Nolan, doesn't have the name value to attract more than a modest crowd. The film may lack marketing fireworks at the moment, but it's already drawing some impressive figures from major movie sites. Fandango.com ran a poll of its visitors late last month about which film not based on a known product or movie would prove the summer's sleeper hit. Inception came in first. Over at Flixster.com, Inception ranked as the second most anticipated movie of the summer behind Iron Man 2. And the film boasts a 92 percent "want-to-see rating" at the site, one of the top want-to-see scores of the summer, according to site spokesperson John Singh. If there is high interest in a title, then a low key approach can click at this point in the marketing cycle, Marich says. He adds the Warner Bros. marketing campaign for the film may be in its infancy. A movie shouldn't peak too early, and thrillers are even more susceptible to buzz that builds--and crests--before the opening date. "Warner correctly figures it's not a good idea to have moviegoers ponder the plot's mystery for a long time," he says. "That calls for an online campaign gearing up just before release." "The downside is that a late-starting campaign doesn't take off and then it's too late to re-launch," he says.